March | 2012 | Better Offer? Chocolate Is Good For You – It’s Official! Back in February, following a routine visit to see my doctor, I was told that I was overweight because my Body Mass Index was too high. Until that visit, I hadn’t felt overweight and I didn’t look overweight (unless I was standing next to a rake) – at least I didn’t think so. However, a closer inspection later that evening in the mirror revealed several chins and a spare tyre! So this week I decided to start a diet. Not by going to a slimming club where you go along every week and reveal how you are doing, but just by cutting back on the really naughty stuff and increasing the five-a-day stuff. I know what you are thinking, if the doctor said I was overweight a month ago, why did I wait till this week to start dieting? Surely that shows a lack of commitment and I will no doubt fail! Well, the truth is that She Who Must Be Obeyed and I had a mini city break to Bruges, Belgium, planned for last week. And as Belgium is renowned for making some of the best chocolate and beer in the world, it would have been crazy to go there when on a diet. Wouldn’t it? However, the sad truth is we never sampled any chocolate. I don’t really know why, every other shop sold the stuff! We did enjoy a couple of their beers though. As we were staying a matter of yards from their oldest brewery, it seemed rude not to. Belgian Beer from the Halve Maan brewery. Meanwhile, back to the diet. As I started day two, I heard on the radio the results of a new study which had recently taken place in the US of A. It was a study which looked at diet, calorie intake and body mass index (BMI) – a measure of obesity. Naturally, my ears pricked up. The study was only carried out using around 1,000 people, but once I heard the results I didn’t care how many ‘guinea pigs’ were used. The study found that those who ate chocolate a few times a week were, on average, slimmer than those who ate it occasionally. Even though chocolate is loaded with calories, it, allegedly, contains ingredients that may favour weight loss rather than fat synthesis – scientists believe! These men in white coats decided that despite boosting calorie intake, regular chocolate consumption, in the study, was related to lower BMI. And this link remained even when other factors, like how much exercise individuals did, were taken into account. They also decided it is how often you eat chocolate that is important, rather than how much of it you eat. This is music to a dieter’s ears (or should that be food to a dieter’s stomach?) However, all this sounds too good to be true, but the researchers say there is only one chance in a hundred that their findings could be explained by chance alone. That’s good enough for me! Now to re-plan the diet and fit in some of this chocolate in between the five-a-day stuff. Actually, I wonder if a bar of fruit and nut chocolate counts as one of the five-a-day? But wait, it gets better. There was also a study which claimed chocolate may be good for the heart. Consumption of certain types of chocolate has been linked to some favourable changes in blood pressure, insulin sensitivity and cholesterol level. And chocolate, particularly dark chocolate, does contain antioxidants which can help to mop up harmful free radicals – unstable chemicals that can damage our cells. 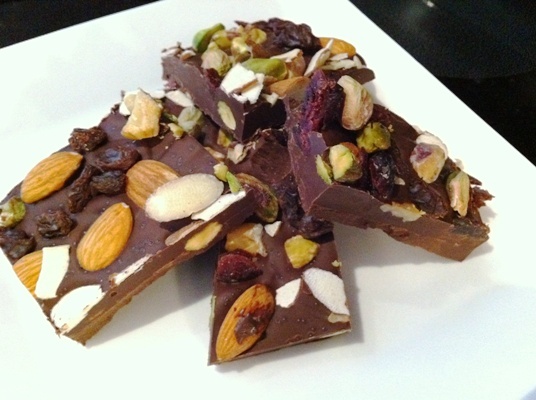 Dark chocolate is my favourite – this diet is going to be a breeze! The team believe that antioxidant compounds, called catechins, can improve lean muscle mass and reduce weight – at least studies in rodents would suggest this might be so. Mice fed for 15 days with epicatechin (present in dark chocolate) had improved exercise performance and observable changes to their muscle composition. Mmm, not sure I really understood that last paragraph, so I think I’ll just take the earlier findings and not worry too much about having the odd chocolate during my diet. I’ll let you know if I gain more chins and a spare tyre fit for a tractor! Categories: Belgium, Chocolate, Diet, Europe, Food, Light Hearted, Postaweek2012, Radio | Tags: Beer, body mass index bmi, Bruges, Chocolate is good for you, Dark Chocolate, healthy-living, Mice, Postaweek2012, Rodents | Permalink.